The School of Law, Christ University hosted its 5th National Conference this year. The theme of the conference Constitutional Appointments: Vignettes and Vicissitudes was selected with a foresight to bring the much required attention of lawyers, law students, academicians, professionals and the whole of legal fraternity to the metamorphosis and debated scenes happening today in various offices appointed under the Indian Constitution. 4. Judiciary’s Perspectives on Constitutional Appointments. The first sub theme was framed with an object to understand that- In the cycle of governance the role of the judiciary is of paramount importance. The role of the judiciary is not just to enforce the law but to protect the interests of the human society which cannot be achieved without a robust and independent judiciary. Keeping with the spirit of the independence of the Judiciary, the collegium of the corresponding Court plays the decisive role in judicial appointments. But time and again issues of non-transparency in the appointments to the judiciary especially when it comes to appointments in the higher judiciary have come to public domain. The Second sub theme was framed with an object to understand that- Governor acts as a defender of the Constitution. He owes an undivided allegiance to the “Constitution and the Law” while undertaking the obligation to devote himself to the service and well being of the people. But over the years we have seen that Criticism has been levelled that the Union Government utilizes the Governor for its own political ends. Lately, it has also been observed that many Governors came to regard themselves as the agents of ruling party rather than the guardians of federal democracy. This sub theme was to analyse the position of Governor as the Constitutional head of the state in the backdrop of federalism. The third sub theme was framed with an object to understand that- The legitimacy and the effectiveness of intelligence agencies are best served where agencies make a clear distinction between the state and regime—though the state is, of course, represented by the transient regime. Legitimate intelligence operations serve the interests of the constitutional state, and are required to resist subordination to the partisan interests of particular regimes from time to time. National security and constitutional values are the touchstone against which legitimacy is to be defined. Intelligence agencies discredit themselves by misdirection; by providing false, misleading and ‘convenient’ intelligence—intelligence that conforms, not to the realities of the ground, but to the expectations of the political executive and other ‘consumers’; or by their willingness to lend themselves to partisan political abuse of powers, or to political and electoral manipulation. With these beliefs and concern, School of Law, embarked its journey of a two day enlightening and mind storming National Conference on 13th of January 2015. The inaugural ceremony was presided over by Mr.T.R.Andhyarujina, Senior Counsel Supreme Court of India. He was the former solicitor general of India and former advocate general of Maharashtra. He has appeared in some of the Landmark cases of the Supreme court: such as Kesavananada Bharti v. State of Kerala, the Parlimamentary Privilege Case, Vishaka v. State of Rajasthan, S.R.Bommai v Union of India and many more. And Mr.Krishna Dixit, Standing Counsel, Election Commission of India and Former Assistant Solicitor General of India. We were fortunate to have such eminent guests inaugurating the National Conference and making it a grand success. The two days conference has seen a total of 209 participants from 49 institutions across the Nation. On the first day, that is 13th of January there was 3 sessions throughout the day, spread across 8-9 rooms. There was a total of 101 paper presentations by 179 participants who were students as well academicians. The sessions of the Conference was presided by 24 moderators who are Lawyers and Professors in Constitutional Law. The moderators engaged in fruitful interactive discussions with the participants after every session. The second day of the Conference had 1 session spread across 5 rooms. There was a total of 19 paper presentations by 30 participants. The sessions of the Conference was presided by 9 moderators who are Practising Lawyers and Professors in Constitutional Law. Prof.V.S.Mallar who was also the Chief Guest for the valedictory ceremony moderated one of the session. 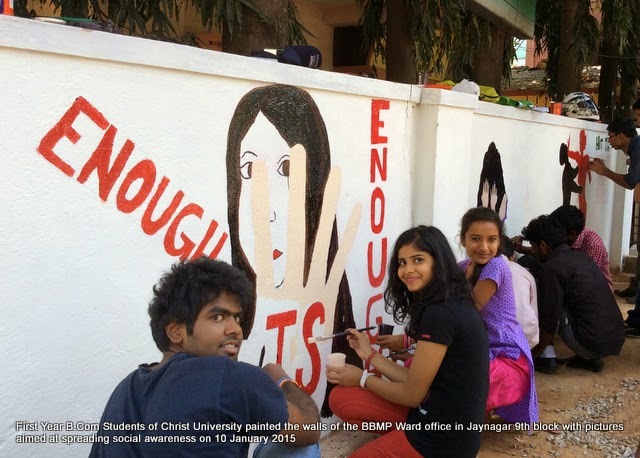 On January 10th,2015, first year B.Com students of Christ University, Bengaluru painted the walls of the BBMP Ward office in Jaynagar 9th block with pictures aimed at spreading social awareness. This was done on the instigation of the English Dept. 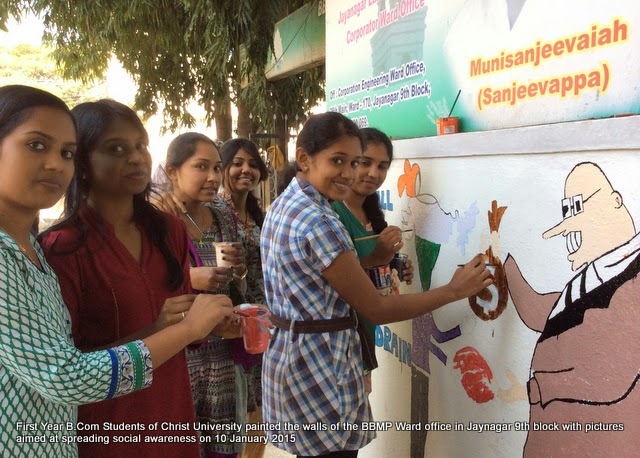 and in collaboration with the CSA (Centre for Social Action), an NGO active mainly in South India. The main object of this was to edify the community about the burning civic issues that plague our country. 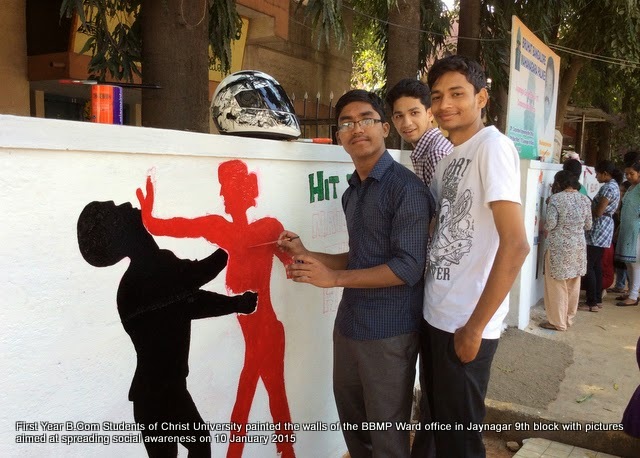 The activity started at around 8 A.M and got over by 3 P.M.
A total of four diagrams were painted on the front wall of the BBMP Office, each carrying a social message. 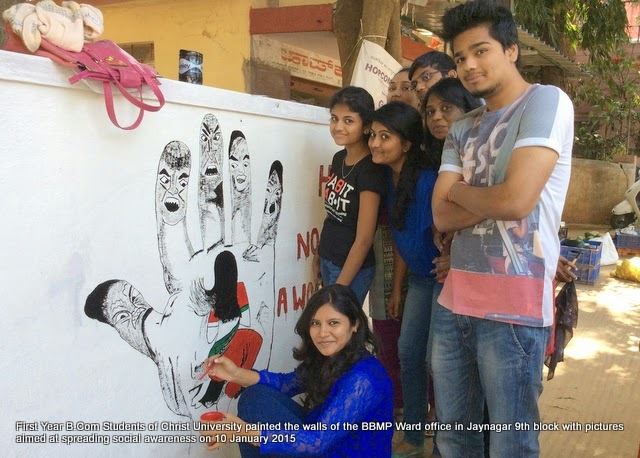 These diagrams convey messages relating to women empowerment and also about the issue of Brain drain (or) Talent drain. One of the diagrams shows a woman sitting on the palm of a hand. The five fingers each carry the face of lustful, perverted men who stare at her in a very degrading manner. This conveys the message of sexual abuse of women and also protests against the cruel objectification of women by the society. It carries the Shakespearean quote – “Hell hath no fury like a woman scorned”and is a stark reminder of the present state of women in this country. Another picture shows two contrasting situations; one where a woman yields to the harassments of a man and another where she takes the fight to him. The picture carries the idiom “Hit the nail on the head” and urges women not to depend on anybody to protect them and believe in themselves. Another diagram shows a woman protesting against the injustices carried out by the society on her by defyingly showing her hand and saying 'stop'. The phrase "Enough is enough" written alongside the picture reflects the collective mentality of anguished women who desperately need change.The issue of brain drain is represented by a picture which shows an Indian metaphorically selling his brain to a foreigner for cash. It carries the idiom “The ball is in your court” asking talented Indians to offer their services to their Motherland. Brain drain is not given much importance, but its impact can be felt when we look at talented Indians contributing big time to foreign economies. It is also a plea to the government to improve the infrastructure and provide job facilities that are on par with that of foreign countries. These are issues that are contemporary and something that the current generation can very well relate to. Since the building, the walls on which the paintings are done is frequented by people, the reach of the project is likely to be greater. Further, when people know that youngsters are actively involved in spreading social messages, it could be a harbinger and inspire similar actions from others.